Screening of The Bomb. The film will be followed by a Q&A with the filmmaker. 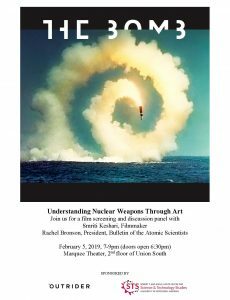 Join us for a FREE film screening + discussion with filmmaker Smriti Keshari, Bulletin of the Atomic Scientists president Rachel Bronson, and Rhode Island School of Design faculty member Tom Weis. The Bomb combines archival footage, animation, music, and text. It immerses the audience in the cultural and technological realm of nuclear weapons. It is big, visceral, non-linear, and seemingly inescapable. Hosted by the Outrider Foundation. Co-sponsored by the Holtz Center for Science and Technology Studies. RSVP on Facebook.